Ibanez has an address book full of artists with signature Ibanez models, although none of them are more distinctive or notable than Steve Vai’s JEM. First produced in 1987, the JEM has seen many iterations and remains a prominent model in all price ranges. Today we are looking at the most affordable entry in the JEM collection, the JEMJR, which also proves to be one of the best electric guitars under $500. Let’s see why! First up, there is a lot going on in the design department – subtle, this guitar ain’t! In essence, it is the exact same guitar as the Ibanez RG450DX, which is yet another Ibanez icon worth considering in this price range. However, there are some additions that make it an undisputed member of the JEM family, such as the signature monkey grip on the upper bout and the lion’s claw rout behind the tremolo. 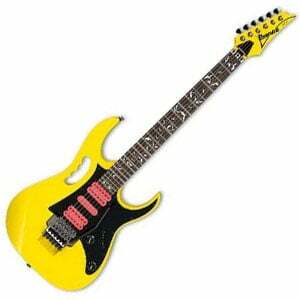 As for colors, the neon yellow model with pink humbuckers is sure to turn a few heads, as is the shocking pink model. However, for the less extroverted among you, the simple glossy white is very elegant. The body itself is made from solid mahogany and features a Wizard III maple neck, which Ibanez claim is ‘the fastest-playing neck in the business’. While there are certainly some competitors, we would be silly to disagree – it’s so sleek. This neck features a jatoba fretboard with 24 jumbo frets and the familiar acrylic tree of life inlay. Hard to pick any flaws with the design or build quality for the sub-$500 price tag. The body and neck undoubtedly steal the show here, but there’s enough going on in the hardware department to make the JEMJR a reliable and gig-worthy guitar. Like its slightly quieter brother, the RG450DX, this model also features three of Ibanez’s passive Quantum pickups – two humbuckers sandwiching a single-coil. These are controlled by a very simple master volume and master tone control, as well as a five-way pickup selector switch. Up top, it features standard Ibanez black tuning machines, which are decent, although you won’t have to use them often as the locking nut and double-locking bridge keep tuning incredibly stable, regardless of how much you abuse the tremolo arm. While not high-end in its tone, the JEMJR offers a pretty flawless sound. Naturally, it is geared towards heavy rock and metal, with the two beefy humbuckers proving very hot and just as articulate, while keeping background noise to inaudible levels. The middle single-coil offers a more refined sound, although you can’t help feel it will be underused in comparison to the robust bridge humbucker – especially when the overdrive is cranked up. Regardless of the finish you opt for, the JEMJR will naturally appeal to you if you are a Steve Vai fan or a real showman. However, it’s more than just a showpiece – this guitar performs incredibly well for the affordable midrange price tag. A hefty but detailed rock tone, reliable hardware and a blisteringly fast neck all combine to make this a sensible choice for any stage shredder. For more info about the Ibanez JEMJR Steve Vai Signature, click here. For more electric guitars under $500, click here.